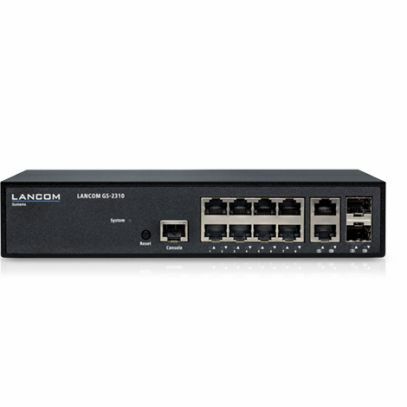 This fully managed switch is the professional solution for internal networking with its eight Gigabit Ethernet ports and two combo ports. The fanless design makes it ideal for office environments and for sub-distribution of in-store infrastructures—wherever you need full management functions but not PoE-based power. In terms of quality and performance, the smallest managed switch is in no way inferior to its larger relations and, thanks to its range of functions, it offers security and versatility. In combination with the LANCOM Management Cloud you benefit from user-friendly, automated and efficient administration via SD-LAN.